Secret Places to Experience the Real Caribbean Spirit. On arriving in the Americas, I only had Central and South America on my mind. 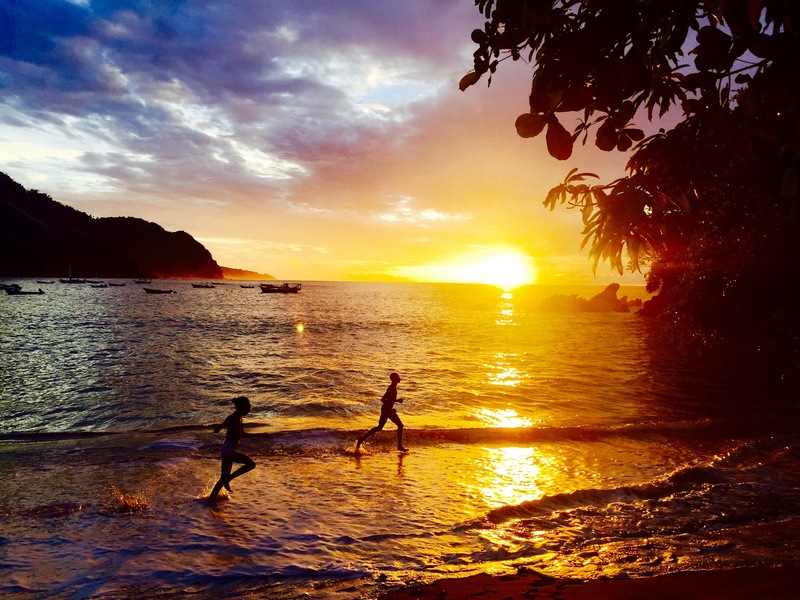 The reggae vibes and postcard beaches of the Caribbean seemed too out of reach and too expensive, until I serendipitously met two adventurers from the Garifuna community in Honduras. I was fascinated by their stories of growing up in the Caribbean – beyond fancy all-inclusive resorts that make magazine covers – where life, despite the hardships, is a celebration. And so is death. I discovered this spirit travelling through Trinidad & Tobago, Dominican Republic, and the Caribbean coast of Panama and Honduras. I found myself in small mountain villages and farming communities, with pool tables in the front yard and reggae music pouring out of colorful houses; in tiny seaplanes around the islands, where people don’t get up right after landing to grab their luggage, because no one’s in a hurry; and in open-air bars where locals bought us rounds of beer to welcome us to their part of the world! My heavenly abode at La Vapeur Estate. The native Paramin people – with French Creole and Spanish roots – still live in the remote northwest mountains of Trinidad, cultivate rare herbs, make wine from hibiscus flowers, gather to sing their traditional Parang music in the week leading up to Christmas, and rely on the rainforest for medicinal cures. We had a chance to glimpse their way of life while staying at La Vapeur Estate, the classy vacation home of a Trinidadian couple in the mountains of Maraval. Think, a modern glass-panelled studio perched on a mountain, engulfed by clouds, overlooking the deep blue Caribbean Sea! Cooling off in the Caribbean. In an attempt to fall off the map in the Dominican Republic – and some might say, experience the way the Caribbean was in its pre-tourism days – I found myself on a guagua (local minivan) to the underdeveloped region of Barahona on the southwest coast. In the backyard of my room at Casa Bonita – once the summer house of the native Schiffino family – were untouched acres of rainforest with natural swimming holes, hiking trails, an organic garden and its own zipline! When sunsets painted the skies red, I returned home and cooled off from the day’s adventures in my infinity pool, hearing the sounds of the sea from the surf beach across. I discovered this tropical lodge thanks to Small Luxury Hotels of the World, a collection of experiential accommodations across the globe. Local (vegan) food in Tubagua village. As I rode pillion on a ‘moto-taxi’, away from the popular Dominican beaches of Cabarete and Puerto Plata, the wind ruffled my hair up winding roads and my chatty ‘chauffeur’ invited me to join his friends for a game of pool. Nearing Tubagua – a tiny farming village set in lush palm-fringed mountains – every passerby waved him hello, and glimpses of the deep blue sea stretching into the horizon mesmerised me. I wonder if the Canadian ambassador to the Dominican Republic picked up on the same feeling when he decided to set up Tubagua Plantation Ecolodge. Sleeping to the rustling of palm trees in my wooden, thatched-roof palapa, taking a dip in the plunge pool on hot days, meeting fellow travellers over communal dinners and witnessing dramatic sunsets made me feel right at home. Stand up paddle boarding off Guanaja Island. I remember feeling like an explorer on my kayak, navigating the waters around Guanaja Island off the coast of Honduras, for this is an island with no roads. Signs for ‘taxis’ from the airport lead to boats docked on the water; instead of cars, we saw kayaks parked outside the homes of locals; the airport doubles as a football field – the only flat stretch of land! I loved sleeping to this Caribbean dream at La Giralda, a homely boutique hotel that sits on an island of its own; swapping stories, snorkelling with lion fish and drinking beer with Oral, who hosts travellers here, made us feel like locals for a while too. Feeling inspired in Valle Nuevo National Park. While looking at a map of the Dominican Republic, I found myself drawn to a far-from-civilisation kind of green spot in the centre – Valle Nuevo National Park. When a long bus journey and four wheel ride deposited me there, it was nothing like I had imagined. I was surrounded by dense pine forests on all sides, with only farming valleys in the distance adding color to the green monotones. Butterflies danced along as I hiked. Strange rock formations lined the edge of the forest. Birds sang on the shores of the lake. They say that on the other side of the mountain is a secret valley of happiness! Villa Pajon – a family-run farming estate turned forest lodge – was a serendipitous find, with rustic yet chic bungalows and a fireplace to keep warm on chilly nights. A far-from-civilization experience unlike anything I expected from the Caribbean. A magical Dolphin Bay sunrise. I wasn’t sure if overthrowing my budget and spending an entire day travelling to Panama at the end of my Central America trip would be worth it. But the moment the boat docked on a private island 1.5 hours away from the backpacker town of Bocas Del Toro, I knew it would be. By night, we watched bioluminescent algae glow in the dark waters, and by day, dolphins swam with their babies and sting rays back-flipped out of the water right in front of our hammocks! We snorkelled amid some of the most colorful corals and fish I’ve seen – almost like a natural aquarium in the middle of the Caribbean. That ‘Life of Pi’ feeling of being cast away in the remote waters felt more real sleeping at Dolphin Bay Cabanas, where my groggy eyes always opened to magical sunrises. After all, the best dreams are the ones you don’t need to wake up from. Ain’t no sunset like a Caribbean sunset. What does your Caribbean travel dream look like? *Note: Some of my Caribbean adventures were made possible by La Giralda, Small Luxury Hotels of the World and Airbnb. Lucky me! Join me on Instagram, Facebook and Twitter for more offbeat adventures. Connect with me on Pinterest and Google+ for daily travel inspiration. Subscribe to my newsletter to receive travel tips in your inbox! You really are lucky having an opportunity to visit these amazing places. Thank you for sharing this great post. The sunset is…. Ain’t got no words to describe it..!! Wow! As I am planning mine, I was super confused as to where to start. This was really helpful and such wonderful pictures. Thanks Shivya! Your descriptions are so vivid!!!! Thanks Pragya, I’m glad you think so! Thanks Michaela! I’m sure you’ll love the DR, it was so easy to fall in love with. I’d love to visit St Martin someday! I recently wrote a post about Caribbean Sailing Vacations for a leading travel company. Just doing research online, from the best comfort of home, about great sailing destinations that the Caribbean archipelago has to offer, I was already in awe. Now that I’m reading this post, I can only imagine in my wildest dreams that you definitely had a blast exploring these secret places and immersing in such activities. Hey, love this post! I feel like I’m right there in the Caribbean. (Wish I was!) Traveling is such an amazing experience, better than any iPhone or tablet or gadget that money can buy. I recently read about a study that found that people who spend their money on experiences, rather than things, find more happiness in the long-run. I think this is directly related to traveling. More new experiences = more happiness. I’ve also started a travel-ish blog recently about Taiwan, and I hope to capture the same essence that you have. Thank you for sharing! One word of advice since you are a seeker . Its not good for your health and spiritual well being, if you keep posting the pictures of food you eat, especially just before you eat. Instead, practice this. BE with what you are eating 100% till the last morsel and just eat quitely. Just write about it, if you want to inspire people to become vegan but no pics. Do not click them either. One day you will realize why. This is post is such a beauty. Dreamy pictures of gorgeous locations with effortless easy writing, makes me want to go and travel there asap. Just to unwind. Previous PostPractical Ways I’ve Learnt to Stay Safe While Travelling Alone. Next PostSoul Searching in the Ecuadorian Andes.